This model is from the same "railway shed" as the Flying Scotsman I reviewed a few months ago. As I mentioned back then this is really a 3D puzzle and according to the packing, can be completed without cutting or gluing in 3 to 4 hours. However, this is one of the best 3D puzzles I've seen and I can't think of a kit that is "proper". All my earlier comments about the Flying Scotsman apply here. parts fit well - too well in some cases, the instructions are easy to follow and it took me more than 12 hours to make. Cutting off the tabs and filling the gaps together with painting edges took up most of the extra time. Very nice. The only other Mallard paper kits that I know of is from Fiddlers Green, and one that I bought about 20 years ago from Bob Bell of the Old Strathcona Museum. She's a beauty! My train simulator game allows me to get on the footplate and drive the Mallard really fast. Wheeeeeeee! I agree! That's one of the best "no glue" model kits I've seen in a long time. Looks good to my eye, and it captures the look of the Mallard. Very nice build Mike. You've cleaned up the tabs exceptionally well. I was surprised to find how few models are available of this venerable speed record breaker. The Hornby one is just a bit eye-watering I agree. 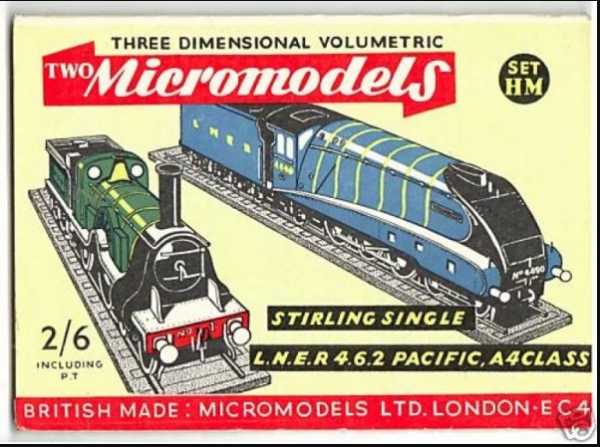 I felt sure that there MUST have been a MicroModel version issued, but research shows that although they did put out a Blue liveried LNER 4.6.2. Pacific A4 Class loco, it wasn't specifically the "Mallard". Perhaps it was issued before she made the run. Last edited by JohnM; 02-27-2019 at 05:21 AM. Thanks for mentioning the Micro kit John. I think I may have this also in my ever-increasing pile. Nice looking. Does it float?